Brian Feser’s vision is to exponentially increase MILSPRAY's top line growth over the next two years while planning for long term growth, sustainability and viability. Having taken over as CEO in May, Feser is restructuring the company and adopting a fast forward-looking strategy to take advantage of the opportunities in the armoured vehicle market as well as in other technology verticals that MILSPRAY is involved in. The Lakewood, NJ-based company has been supplying the Department of Defense, commercial organisations and other government agencies with products and services designed to extend the life of military vehicles, aircraft, ships, weapons and equipment for the last ten years. The new CEO now wants to expand the scope of the company’s product line while also looking to international markets for future growth. Defence IQ spoke with Mr. Feser to understand more about his vision for the company and his plan of attack on an industry hit heavily by the financial crisis. The first question, simply: Why did he join MILSPRAY? "Simply put, it is a great company with phenomenal people and products. Based on my defense industrial base; military career and commercial sector background, coupled with my understanding of MILSPRAY products, solutions and services, I knew that we could not only provide value and safety to our customers in the commercial and defense sector both internationally and nationally, but peace of mind as well. I truly felt that this was the place I wanted to be. I compare it to "building an airplane in flight," and leading MILSPRAY into its next phase of dramatic growth will be both challenging and rewarding." Feser said. A retired U.S. Army Lieutenant Colonel and Vice President of Strategy at Textron Marine & Land Systems and later serving as Vice President of International Business Operations for Textron Systems – with a master’s degrees in human resources and business management from Central Michigan University and a master’s in national security and strategic studies from the Naval War College – Feser is well placed to lead MILSPRAY into new military and commercial markets. How has his 28 year military career prepared him for his position as a business leader today? "I’ve deployed and worked in combat zones in Bosnia, Iraq, Afghanistan, Libya, East Timor and the one key thing I took away from being in the military is to build a team and work towards a common goal," Feser explained. "In the military you’re fighting for the men and women at your side. In business today I’m using the same philosophy where you fight for the employee or manager by your side, left, right, up or down, while always remembering to ensure that your customer is at the center of all that we do." The company is currently developing specialty coatings for blast and ballistic resistance that can be applied to buildings, vehicles and other structural components, which Feser said was a particularly exciting new technology that MILSPRAY is bringing to market. "MILSPRAY has an outstanding applied research and development team of scientists and chemists. This new generation of ballistic mitigation technology eliminates bullet and shrapnel ricochets which pose a significant threat to bystanders. "The R&D team is working in partnership with the United States Army Research Laboratories (ARL) to develop these systems further for use with existing ballistic steel, chemical agent resistant coatings (CARC), and self-decontaminating nano-coatings." MILSPRAY is also further penetrating into the composite armour market, which Feser sees as a natural fit for the company’s ingrained technical experience and expertise. "To complement these coatings, we are introducing a new product line of ballistic-resistant composite panels," said Feser, explaining that they have been tested and meet National Institute of Justice (NIJ) and Underwriters Laboratories’ (UL) standards for ballistic resistance. "The composite panel technology will add ballistic protection to standard issued vehicles for federal, state and local law enforcement as well as the commercial vehicle armoring market. In fact, we already have these in service – we’ve partnered with our local police department to install the composite panels within their police cruisers." MILSPRAY believes in the near future, the use of steel and corrosive metals will decrease and the use of noncorrosive composite-based and polymer-based materials will be integrated within armoured vehicles during the manufacturing stages, which is why it’s focusing on this market now. Feser explained that lightweight composites allow for greater speed and endurance while maintaining survivability. He said composite armour and vehicle structures will be "the next wave of the future" and indicated he expects this to filter down into the commercial sector, which MILSPRAY is also eyeing as a future growth market vertical. While the contracting defence market in North America and Europe has stunted growth for many companies in the industry, MILSPRAY was well positioned to ride out the storm because prolonging the useful life of military vehicles and equipment is even more important when purse strings are tight. MILSPRAY and how will it adapt to the new norm? "I am very confident in the growth of the armored vehicle market," asserted Feser. "The growing importance of the homeland and border security sector in the developing countries is leading to the rapid demand of armored vehicles in the developing nations in the Asia Pacific (APAC) region, on the African continent and the Middle East. The peace initiative missions undertaken by most of the countries on the continent of Africa as well as in the Middle East are one of the primary causes of this growing demand." "Moreover, back home in our domestic market the return to contingency is driving the need to maintain vehicles in a state of readiness, which MILSPRAY is perfectly positioned to do through our corrosion services, vehicle wash systems and innovative ballistic products," Feser explains. This approach has allowed the company to sustain its business throughout the recession and, following the past drawdown from Iraq and Afghanistan later this year, Feser now plans to build on this and further diversify the company’s offerings. To this end the engineering team developed a renewable energy system for the military, the Scorpion Energy Hunter. Feser explained that the use of stored renewable energy in transport vehicles and the ability to operate off the grid is a "growing area of interest" for the military. This system is already in operations today within the US military. "There’s a DoD mandate in the United States to reduce emissions by 25%-30% over the next ten years and increase renewable energy in the military. Our systems can be retrofitted into a standard trailer and used in any military service across the world." "As the technology improves it will quickly be applied to vehicles, including armored vehicles. There are also various battery technologies in the works including several breakthroughs in non-traditional storage such as fuel cells." While the company’s primary vertical historically has been the military, Feser is keen to open new avenues for growth and has drawn up plans to move into other sectors. "It [the Scorpion energy system] can also be used for commercial applications, such as after natural and manmade disasters – quite frankly we can run small cities and compounds off our energy systems. We expect renewable energy in the commercial sector to outpace the military side because of the budget squeeze." 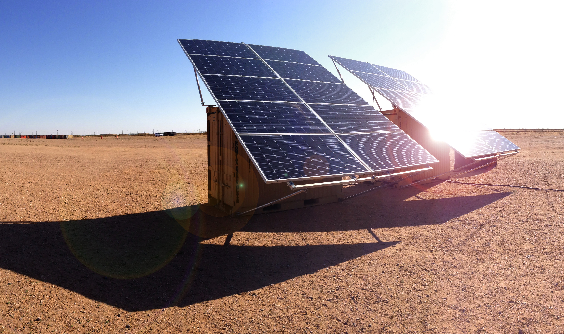 The vision is to provide a universal energy solution for global use; to provide mobile renewable energy systems that provide critical power to military command posts and forward operating bases as well as organisations in third world countries where grid power is scarce or non-existent. Is the move into renewable energy a risk for MILSPRAY? No. Feser believes there is huge market potential for renewables: "We’re planning for the future, we are planning on success," while building the airplane in flight, he assured.